5.5.1 Outline the binomial system of nomenclature. 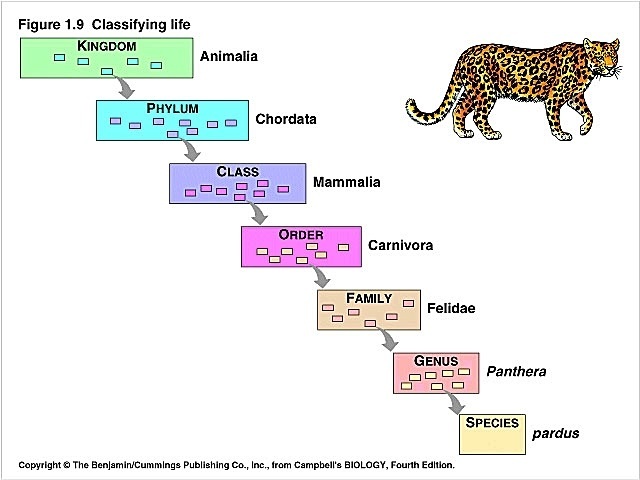 5.5.2 List the seven levels in the hierarchy of taxa - kingdom, phylum, class, order, family, genus and species - using an example from two different kingdoms for each level. 5.5.3 Distinguish between the following phyla of plants, using simple external recognition features: bryophyta, filicinophyta, coniferophyta and angiospermophyta. 5.5.4 Distinguish between the following phyla of animals, using simple external recognition features: porifera, cnidaria, platyhemlnthes, annelida, mollusca and arthropoda. 5.5.5 Apply and design a key for up to eight organisms. Create a common website giving information for classification of plants and animals. 1. Home page- information about classification and name your site. 3. Subpages for each phylum- with at least 4 examples. The website has to be finalised by 17th Nov 2014. This will be considered as a part of your CAS activity (developing research skills, writing skills and webpage construction). Do not directly copy and paste information, after reading from from different webpages write down the information in your own words. Click pictures if possible for the examples or if taken from the net site the source. For examples check out different organisms and select the ones that shows some important or unique features. The binomial system of naming was devised by Carl Linnaeus. In this system the first name is the genus name; the second name is the species name. The first letter of genus name is in upper case and the rest of the binomial is in lower case. The local / colloquial names can be very confusing as they differ from place to place. The binomial naming helps international communication. 5.5.2. The seven levels in the hierarchy of taxa.